Gating with the bells and whistles. Gating's usually a pretty straightforward process, right? Maybe it's a couple of controls on a channel strip or, if you're looking to take it more seriously or creatively, it's a dedicated plugin with a couple more parameters added. 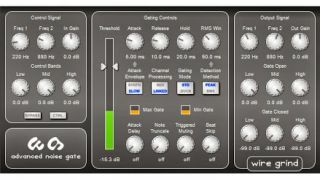 But Wire Grind is challenging Windows users to see what they can get out of hugely increased gating possibilities with the release of Advanced Noise Gate, a VST plugin. "The world's most advanced noise gate," so they say. Output EQ for the entire signal and for Open/Closed gate. Get it for $149 or check out the demo at the Wire Grind website.